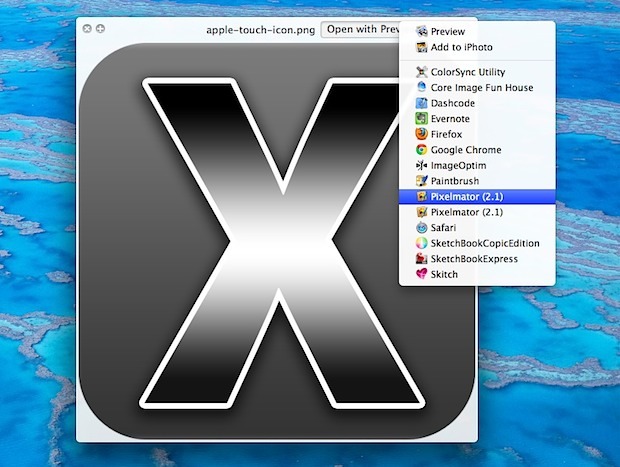 Quick Look is one of the most handy features in Mac OS X to quickly get a preview of files, but you can also use it as an application launcher of sorts to quickly send a file to the file types default app, or even launch the file into another compatible Mac app. Used this way, it is sort of similar to the “Open With” menu that can be summoned by right-clicking on a file within the Finder, but Quick Look gets the upper hand because it provides a preview of the file in question. Selecting another app will immediately launch the file from Quick Look into that app. This works with just about any file type, so long as the file type is recognized and there are applications installed that could read it. If you see apps in the list that shouldn’t be there given the file type, clearing the Open With menu will impact both Quick Look and the right-click option. The video below shows this in action, it works well as you can see. In case you were wondering what the app recommendations are based on, the default “Open with” choice is the app associated with that file type by default, and the other app options are other applications that can also open the same file type. As usual there are many other options available to Quicklook, for example you can also enter the slideshow from that same quick look preview, if it’s a group of images that has been selected with the feature. This handy little trick was originally covered over amongst another tip here at osxdaily and it frankly it’s useful enough that it deserved its own post! Interesting little hidden trick, though I don’t know how much more I’d use this than just right-clicking the file to use Open With menu. Left-click and hold the Open With Preview button also brings up the menu. In fact there are quite a few Left-click and hold menu options on ML. Show All in System Preferences for example. I think I am too stupid for this trick. There is no “Open with…” button in my Quick Look app. And yes, it’s 10.8.1. EDIT: Ooom. Hitting the spacebar opens another kind of Quick Look as the double click. I even did not know that there is a difference between Quick Look and Preview. Lession learned.